These extra spacious rooms have two full beds and boast 450 sq. ft. with the ability to connect to another double room, and optional access to a full kitchen. Each Treman Lodge room has a large picture window that overlooks grass, trees, and bird feeders. 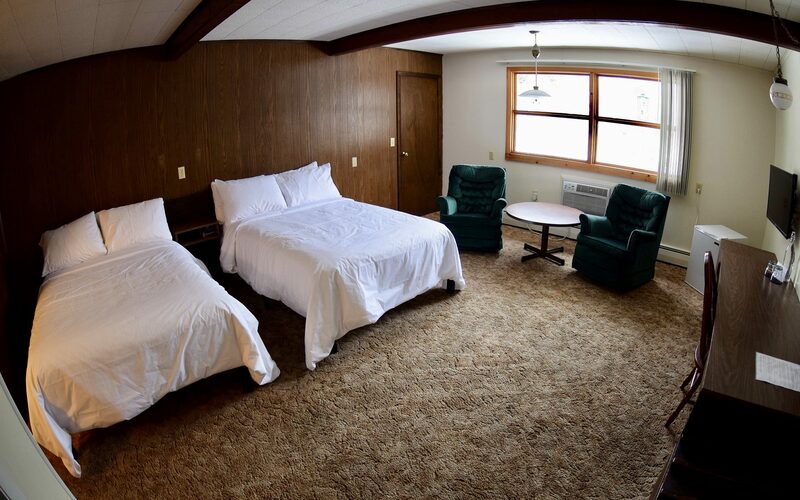 All rooms have a private bathroom with tub / shower combo, hair dryer, iron, ironing board, air conditioning, extra pillows, blankets and towels. Natural bath products, complimentary Wifi, TV, and an alarm clock radio are also standard. Kitchens are an additional $20 daily charge and come equipped with pots, pans, dishes and glassware, plus olive oil, salt, and pepper. You can add the kitchen option at check out.